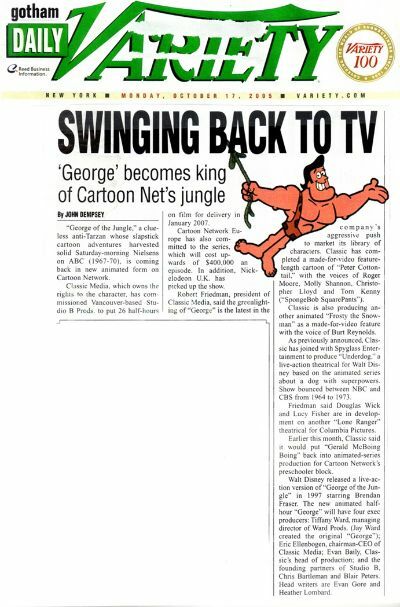 So...here's the piece in Variety, and yes, it really does mention our names at the very, very bottom--we just can't figure out how to make it bigger.� GoreAndLombard.com have graciously agreed to be Head Writers on "George of the Jungle" for Cartoon Netowrk. It's gonna be a "swinging" time. ByJOHN DEMPSY "George of the Jungle," a clueless anti-Tarzan whose slapstick cartoon adventures harvested solid Saturday-morning Nielsens on ABC (1967-70), is coming back in new animated form on Cartoon Network.Classic Media, which owns the rights to the character, has commissioned Vancouver-based Studio B Prods. to put 26 half-hours on film for delivery in January 2007. Cartoon Network Europe has also committed to the series, which will cost upwards of $400,000 an episode. In addition, Nickelodeon U.K. has picked up the show. Robert Friedman, president of Classic Media, said the greenlighting of "George" is the latest in the company's aggressive push to market its library of characters. Classic has completed a made-for-video feature-length cartoon of "Peter Cottontail," with the voices of Roger Moore, Molly Shannon, Christopher Lloyd and Tom Kenny ("SpongeBob SquarePants"). Friedman said Douglas Wick and Lucy Fisher are in development on another "Lone Ranger" theatrical for Columbia Pictures. Earlier this month, Classic said it would put "Gerald McBoing Boing" back into animated-series production for Cartoon Network's preschooler block. Walt Disney released a live-action version of "George of the Jungle" in 1997 starring Brendan Fraser. The new animated half-hour "George" will have four exec producers: Tiffany Ward, managing director of Ward Prods. (Jay Ward created the original "George"); Eric Ellenbogen, chairman-CEO of Classic Media; Evan Baily, Classic's head of production; and the founding partners of Studio B, Chris Bartleman and Blair Peters. Head writers are Evan Gore and Heather Lombard.